The Metro will use the state-of-the-art technology available globally - the communication-based train control. KOCHI: The signalling trial of the Kochi Metro between Aluva and Palarivattom is progressing satisfactorily, E Sreedharan, Principal Advisor to Delhi Metro Rail Corporation has said. The Metro man conducted another inspection on Friday to assess the works. The Metro will use the state-of-the-art technology available globally - the communication-based train control (CBTC). Under it, the data transmitted by various trains is processed at the operation control centre and commands are given back to trains in the form of target speed and target distance to enable automatic train control. “Thus, the trains can run at intervals of about two minutes. The space constraints in Kochi to construct longer platforms to run longer trains have been overcome by reducing the headway (time gap between arrival of subsequent trains). This system enables automatic train protection and automatic train operation,” said a statement from DMRC. Kochi Metro will be the first such project in the country to introduce CBTC technology for signalling when the Metro commences revenue operation. This technology has been adopted to give the latest system to Kochi Metro to overcome local constraints. The system will provide visual information to passengers with respect to the arrival of the next train and the time in which it will reach the station which is updated every minute along with announcements. 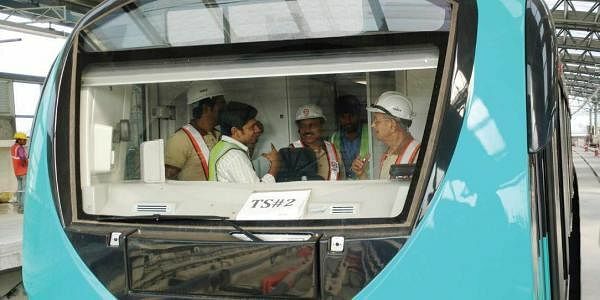 DMRC project director Dani Thomas, chief signal and telecommunication engineer K S Krishna Kumar and a team of officers accompanied Sreedharan during Friday’s inspection.